Emerald City Initiatives’ mechanical engineer, Rebecca Baldwin (pictured with RSD hardware being tested in the lab prior to delivery), stepped in mid-way through the design and build of the Ring Shear Drop Flight experiment hardware which is destined for flight to ISS aboard a Dragon resupply mission later this year. This hardware will enable the investigation of processes that are sensitive to the presence of solid walls, since fluid containment can be achieved by surface tension in the microgravity environment present on ISS and enable the elimination of containers, as well as influences from sedimentation of aggregates and buoyancy driven convection. The initial process to be investigated is the transformation of protein in solution into amyloid fibrils; these are protein aggregates associated with neurodegenerative diseases such as Alzheimer’s and Parkinson’s, one of the main health challenges of our time. Throughout Rebecca’s engineering journey, she has accumulated skills that she has been able to use for the benefit of the RSD hardware. Overcoming challenges and problem solving, both hallmark characteristics of engineers, is routine work for Rebecca on the RSD project due to the fine balance between budget and available commercial hardware that can be adapted for space, as well as supplementing with new hardware capabilities, and integrating with the existing hardware and software capabilities available in the ISS National Lab. Before working on RSD with Emerald City, she spent ten years accumulating design and production knowledge in precision machinery in compressors, valves in the commercial arena, as well as gun systems in the defense sector. 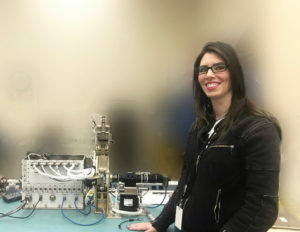 She has been excited to work on a project that will increase the body of knowledge in the fight against neurological diseases and can’t wait to see the hardware operational aboard the ISS. Rebecca is also an active mother of two young children. The example she sets and her contributions to research aboard the ISS are an inspiration and the basis for her highlight during Women’s History Month.